I know I have mentioned this before but every time I pull my slow cooker out of the cupboard I think of you and smile as I remember your public declaration that slow cookers are not for you, coming a week after I got one for my birthday. I was quite struck by your post, in part because I value what you have to say and also because it followed my efforts of splitting my corner of the facebook community in half as they debated the merits of slow cookers over slow cooking in cast iron - and also the suitability of a slow cooker for a birthday gift. Well, dear Deb, we are about six months down the track so I thought I would let you know what I think the old slow cooker now. First up, the slow cooker is not for the most part, in my humble opinion, a time saver. Where we all I went wrong ten years ago was thinking you could just throw everything in it in the morning, turn it on and come home to a delicious dinner. That was a recipe for bland, broiled meat. Blah. When I use it now I take the time to brown things and get the sauces going. As I like to cook in bulk where I can, it has taken up to an hour of preparation, frying off and creating at least the beginnings of delicious sauces before I reach that point of lobbing it all into the slow cooker and turning it on. So for the most part I look upon it as an electric casserole dish. I do like that I can cook a casserole slowly, over eight hours, turning cheap, tough meat into something glorious. And I like that I can leave it on all day. One could argue that you can just slow cook like that in the oven or on the stove top. For me, I don't really like leaving my oven on and unattended all day. But I don't seem to mind leaving the slow cooker unattended while I leave the house to do other things. I got my men to get me a big one in order to do the bulk curries and casseroles. Consequently it is a big item. It takes up a lot of room in the cupboard. It's heavy. It's a bit unwieldy to clean. I confess that I do have to pick my time and psych myself up to use it. But when the time is right, it's a great thing. I have used it maybe ten times in the last three months. I've tried soups but I don't think I'll persist with this method for soup preparation. It takes a very long time for all that liquid to warm up. I'm happy enough with my big pot and going a bit faster for soup. I should say though that a friend gave me THE most wonderful pea and ham soup recipe for the slow cooker BUT when I served it up one up one member of the family loved it, one tolerated it and one thought he was being poisoned. There was quite some theatre. We haven't had a scene like that at the dinner table in months. Maybe years. It was almost worth it. Almost. The recipe is not dependent upon a slow cooker. I could recreate it in my soup pot if I was feeling like some dinner time amusement again some day. I think my clan prefer the minestrone style of soup. It may be a texture issue with the blended soups...they're not that keen on pumpkin soup either. BUT dear Deb there are three recipes that are to die for. And the lovely Jane has put them all on her blog. Three recipes that are delicious and have had universal appeal at our dinner table. Recipes that had me inviting friends over for dinner the first time I cooked them, so confident was I of their potential for dinnertime happiness. Pulled pork. I have already given this one the three hip hip hoorays on this blog. And research indicates that there are recipes out there for doing it from scratch but the bottle of marinade seems to do the trick very nicely. And this is indeed one recipe where you can just lob the TWO ingredients in, press the button and go. Lamb's equivalent of pulled pork. Oh Deb. This is glorious. Not cheap. But it is absolute deliciousness. It could be done in an oven. But it works really well in the slow cooker. I browned the lamb when I made it. Despite what I said about taking the time to brown things, next time I make this I won't be browning the meat. And again, like the pulled pork, this is a throw it in and leave it recipe. The third one is Jane's recipe for beef stroganoff. It's great for a family dinner with veg or pasta or rice. It's great for a church feast. It's great for leftovers, for freezing and for giving away to a family in need. It's great. And so to the $64 question. Given what I know now, would I still get one given my time birthday again? Well, I think yes. I would maybe opt for the smaller version next time, although that wouldn't allow for leftovers. I don't use it all the time. But when I do I'm pretty sold on it. Which is in no way meant to pressure you into asking for one for your birthday. If you don't have a lot of space in your kitchen or you don't like to have an appliance that you only use occasionally I wouldn't get one. And be warned too - not all recipes for the slow cooker will be as delicious as these three. I have had some epic fails as well. I am learning to know what will actually work and won't end up tasting like broiled, bland blahness. It's not my favourite thing in the kitchen. But unlike the one I bought ten years ago, I won't be giving this one away. It has earned its spot in my kitchen. Hope you are well and that you have great school holidays. Like attracts like. So I am pretty sure that you, dear reader, like reading your Bible like me. That you probably know your way around the whole of the Bible. That you know Bible reading isn't just a daily exercise one does to tick a box but something we do to deepen our relationship with God. That the more you read the Bible, the easier it is to understand and the more you understand it, the hungrier you are to read it. It occurred to me a while ago that rabbiting on about Bible reading here on this blog is probably "preaching to the converted" for the most part. I like to keep you all ( and myself) encouraged. But guess what?? I had a light bulb moment a few months ago. There are people who I sit with in church week after week who find the Bible an enigma. Start from where you left off and don't worry about the dates. Don't be a slave to the dates. Start from where you left off, do double readings as you can and soon you will catch up. Cut your losses and start from today's date. And in late May, just as the plan approached the section where the Old Testament becomes, shall we say, complicated...1 and 2 Kings...I ran a guided tour of the Old Testament. It was a simple thing really. It took an hour and a half over tea, coffee and snacks. 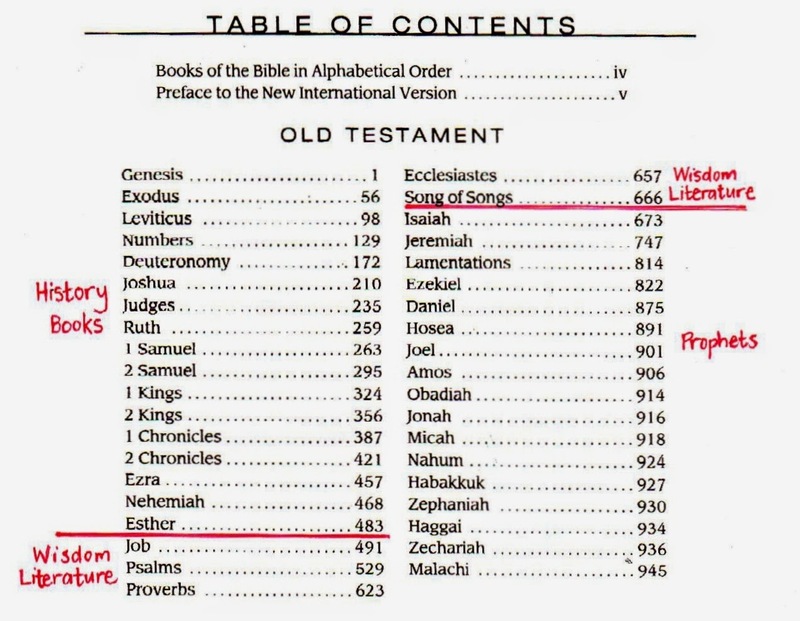 I spent ten minutes going through the contents page of the Old Testament explaining the three different sections and how the genres change, each requiring a different approach to reading. 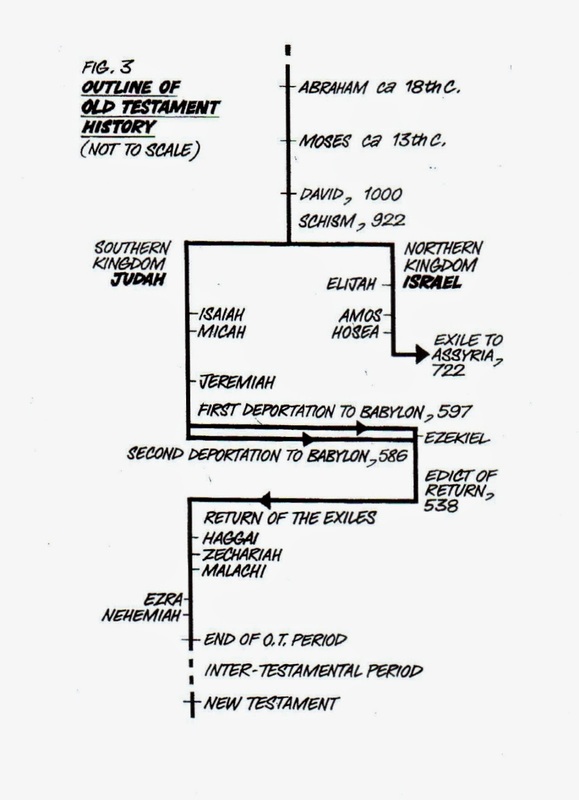 I then spent 40 minutes going through this road map, telling the story of the Old Testament that is covered in the history books. Explaining how the kingdom splits in two is the key sticking point. by Graeme Goldsworthy, page 32. 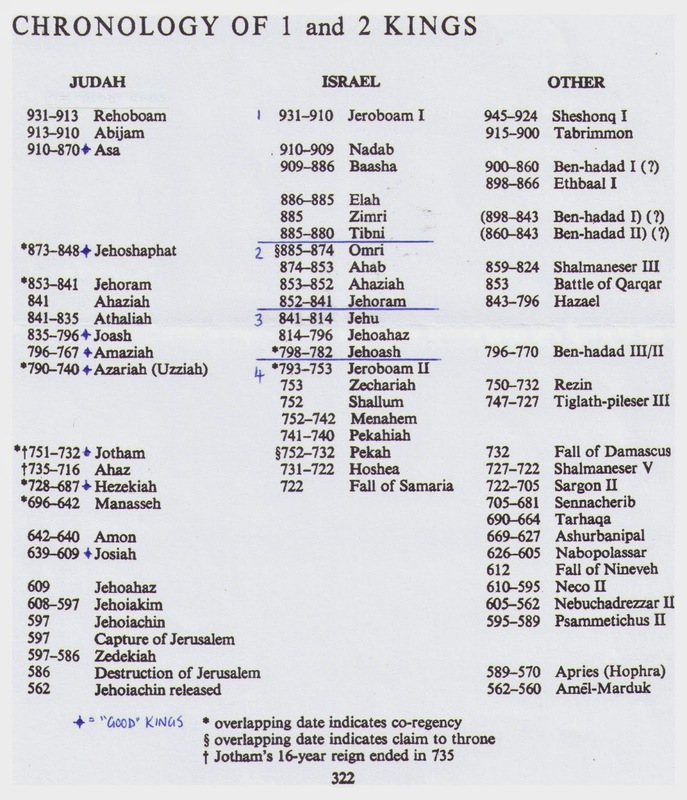 We had a break for a cup of tea and then I spent the last half hour showing this page from the IVP New Bible Commentary found at the beginning of the section on 1 and 2 Kings - a table of who was king - when and where - during the period of the kings. I'd been a Christian ten years, struggling my way through the Bible, before I met that roadmap. What a revelation! And as long time readers will know, it is only in recent years that I have come to grips with the prophets - and that in only a small way. But now I've got a handle on that section of the Bible and it's making much more sense. One of the women who came to the guided tour said that she had been in churches and in and out of the Bible for 60 years and this was the first time she'd had this stuff explained to her. This isn't a criticism of the preaching she's sat under all these years. You just don't learn frameworks during church sermons. That's not what sermons are about. She left encouraged to press on with the hard but rewarding work of Bible reading. There will people you know - people who maybe, just maybe, don't read as widely as you might - who don't know how the Bible hangs together and whose lives will be transformed if you give them the basics. I've been blogging about this sort of thing for years. It's good to have shared it in person with some of those I meet Sunday by Sunday in church and I'm looking forward to doing it again some other time down the track. Oh, and by the way, if you aren't using a Bible reading plan but wished you were, the beginning of July is another EXCELLENT entry point for this plan. And I'll be saying that in church in the next couple of weeks too. I've done a lot of observing of and being with the elderly in recent times. And what I've noticed is that there's a lot of grief for the one who grows old. The grief of watching your friends die - it's no source of glory to be the one who outlives your peers and it's very hard to be oh so frail as to be unable to attend their funerals. The loss of one's driver's license. Didn't downsize in time? The grief of losing the family home and so many possessions as circumstances impose the downsizing upon you. The move to a nursing home that reduces one's possessions to the barest minimum. The grief of loss of capacity - mental and physical. The grief of the transformation from independent, functioning, dignified member of society to one totally dependent, like a small child, except knowing of a full life lived independently. It was never meant to be this way. But even in this world, broken by sin, God shows His love and mercy. Very recently it occurred to me that God has timed the grief of aging perfectly - by putting it at the end. I know that's a perfectly ridiculous statement to make. Stating the obvious somewhat. But let me explain. When I was pregnant for the first time I spent a lot of those months predictably concerned about what lay at the end. The delivery. And yet, by the time I was eight and a half months pregnant (and it seemed to be 40⁰ every day) I was ready to deliver that baby. God's perfect design. Six, seven and eight months was too short to be ready. Nine months (and then ten days overdue) and I was ready. That's the microcosm. The big picture is the span of my years filled to the brim with the stuff of life. Learning, living, loving. And coping with suffering as well. I don't live in Eden and Jesus has not yet returned. The world is fallen. And so there is suffering. Therefore, since we have been justified through faith, we have peace with God through our Lord Jesus Christ, through whom we have gained access by faith into this grace in which we now stand. And we rejoice in the hope of the glory of God, Not only so, but we also rejoice in our sufferings, because we know that suffering produces perseverance; perseverance, character; and character, hope. And hope does not disappoint us, because God has poured out his love into our hearts by the Holy Spirit, whom he has given us. Suffering and grief help me to grow in faith and hope. I hope that I respond with a little more faith and trust in Him with each new grief. I have a lifetime to practice this. And so it occurred to me that God has placed the end of life, so filled with grief and suffering - and there is no way around it...sickness, aging, dying and death are terrible - so that when the span of my years is drawing to its end and I am faced with grief upon grief, I am ready to face it with grace and hope. I observe that you don't get to be a sweet, wise, godly and prayerful old lady (or gentleman) just by being old. It takes a lifetime of sweetness and growing in wisdom, godliness and prayerfulness to bear the grief of old age with grace. It's not that it's any easier for the sweet ones. They have learned to bear it well - with hope. God is good, gracious, kind and wise. Putting the end at the end was no accident. and lead in the way everlasting.